Lodging can be added to any hunt for $50 per night per hunter. One of our most popular exotic hunts, the aoudad, also known as the Barbary Sheep, prefers mountain terrain. Their horns curve outwards, inwards, then backwards. 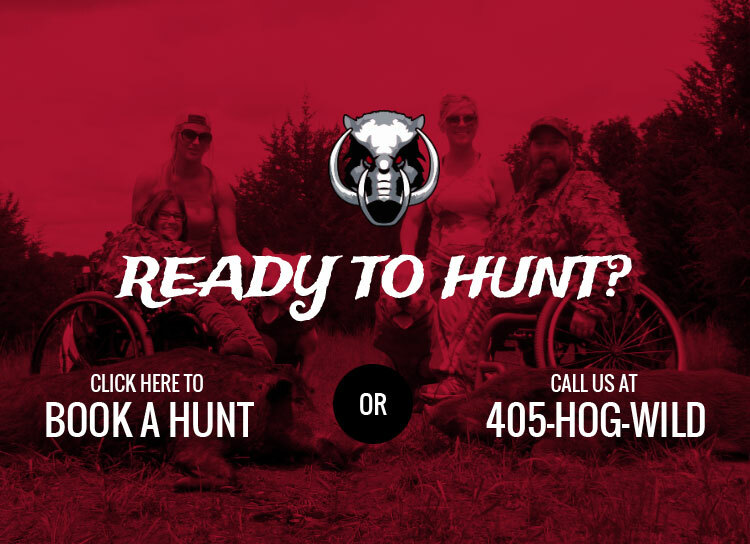 Hog Wild offers year-round aoudad hunts. Call us today to reserve your aoudad hunt. If you’re looking for a unique and impressive trophy, then an axis buck hunt might be right up your alley. Their distinctive spots and large horns make a great trophy for any home. The Blackbuck is the smallest animal in the antelope family. They are also called Antilope cervicapra. Their horns are characterized by a ring shape that spirals upward, and they prefer open areas. Buffalo can provide a great trophy, gorgeous mounts, and even warm rugs. Aside from the trophy, a buffalo hunt is an excellent way to stock your freezer. Are you an experienced hunter looking for a challenging exotic hunt? Catalina goats may be a great option for you. Catalinas have unique horns that aren’t a common sight in most trophy collections.They are constantly alert and have strong senses, making them more challenging to stalk and approach than many exotics. The only time we could even snap a picture of one was when they first arrived at the reserve. Corsican rams are a popular trophy animal because of their large, unique horns. It’s not uncommon for mature males to have horns between 2 and 3 feet long. If you’re interested in getting into exotic hunting, Corsican rams are a great place to start as the cost is relatively low compared to other exotics. The Fallow Deer is considered to be medium in size. The antlers of these deer are very wide and they can easily measure 20 inches in width. Full grown males can weigh up to 200 pounds. They can be a variety of colors. Most commonly, they tend to be a chestnut color, charcoal or almost black or white color. Jacobs sheep can have has many as 6 horns but as their name suggests, most commonly they have four. Both male and females have horns, however the males horns are larger. Adult sheep can weight 120-180 pounds. Jacobs sheep make excellent trophies due to their distinctive characteristics such as unusual horn shapes and sizes. Typically a tannish/brown color with tall curved horns. Males will normally have a longer beard right below their chin area. The massive bases on their horns protrude upward and back and tend to hook at the ends. Males can weigh up to 200 pounds. Elusive animals that prefer steep, rocky ledges in mountainous areas. Rambos are primarily known for their wool, but they’ve become an increasingly popular trophy animal over the last several years. Rambos have the look of more premium exotics without the high cost. Texas Dall are the result of cross breeding of corsican and mouflan sheep. Males have horns that circle and turn outward at tips that can be from 14 inches up to 28 to 35 inches in adults. Zebra hunting provides a beautiful trophy you’ll want to hang on your wall. As one of the most recognizably distinct animals we offer, they are usually slower than horses, but with great stamina.